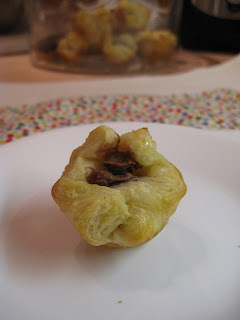 So, I've been dying to make chocolate croissants ever since I came across this post by Joy the Baker. But because I have been neglecting my muffin pan recipes and bombarding you with all sorts of random knowledge, like how I got a super cute hair cut (okay I didn't tell you that but I had to slip it in there cause I'm so excited! Pictures soon to come! 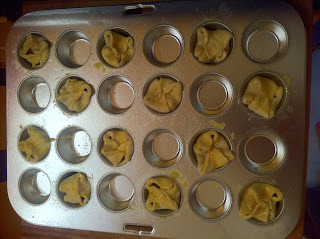 ), I thought it was only right that I take this recipe and muffinize it. 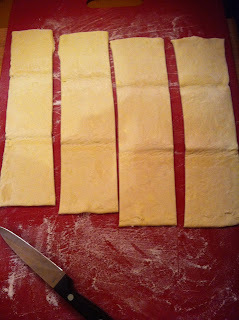 With a few simple changes I adapted Joy's recipe into one I will continue to make for the rest of my life. No joke. It was that easy and tasty! Feast your eyes on these bad boys! And it's so easy to put together, I'm gonna show you how. salt, if you like that sort of thing. I do. My boyfriend doesn't. 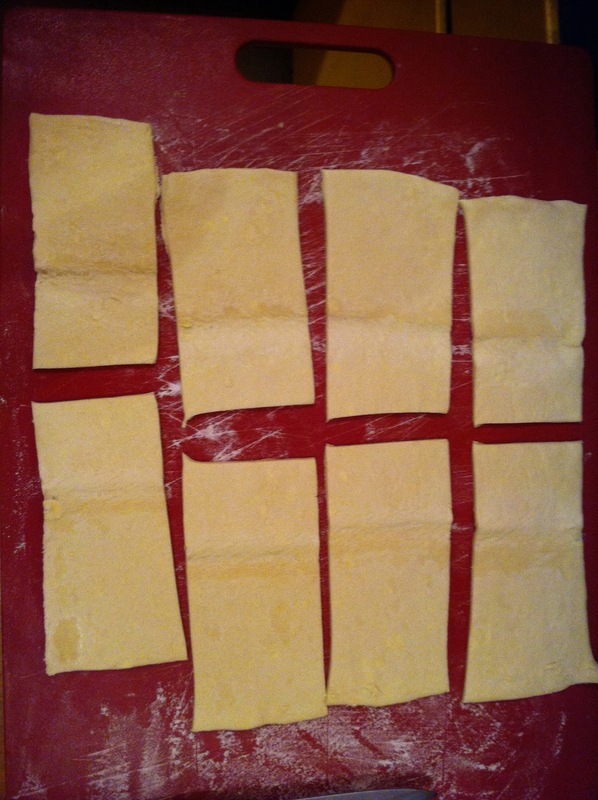 Next lay out your puff pastry and cut it into 4 even strips. Now if you did your math in your head, cause some people do those sorts of things, you might notice that you end up with 16 squares and only 12 cups available if you space them out, like I'm about to suggest. Take those extra four and create mini traditional croissants for those in your life that need to stay inside the box. Or risk it and put them in the tin. Go ahead, BE BOLD! 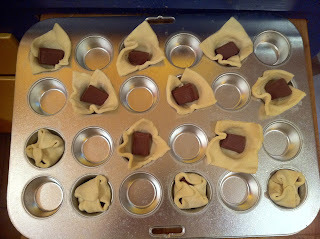 Next place those squares into a greased mini muffin pan. Space them out so that when they bake and expand they don't stick. Place a small piece of chocolate in each square and fold the 4 corners over towards the middle. Bake at 425f for about 15 minutes. Now, I'm a practical person...sometimes. 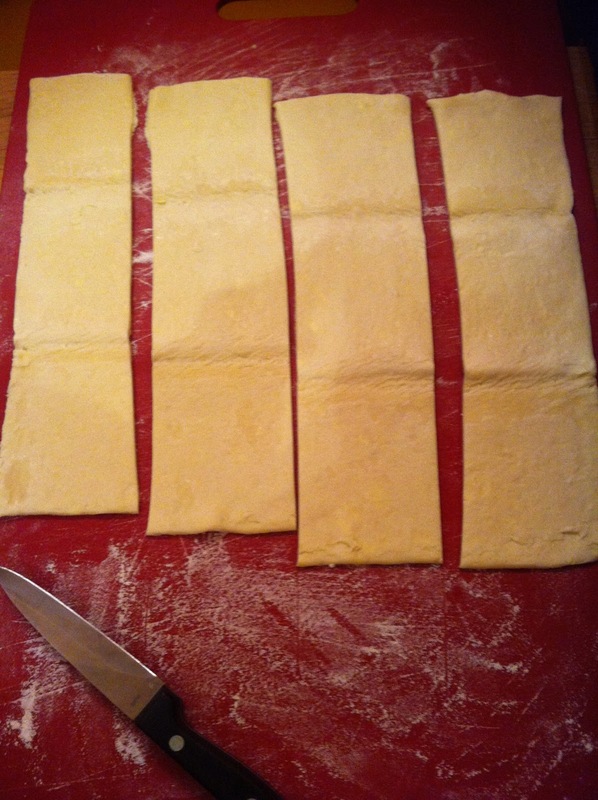 After making these I had a bowl of perfectly good egg and a oven still hot. So I made my boyfriend and I a tasty egg scramble in the regular sized muffin pan. I was already on a role so I couldn't resist. 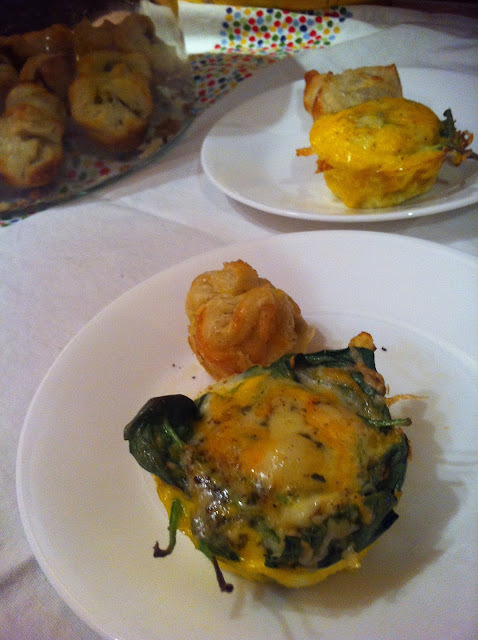 Eggs in the muffin pan are probably the easiest and most creative way I use my muffin pan. Scramble eggs and then pile in the left overs. For these guys I used some left over blue cheese and spinach. The eggs, plus a tasty chocolate puff and I tell you, we were in business. So next time, when you find yourself with extra egg wash you'll know just what to do with it! Hope you enjoy!! 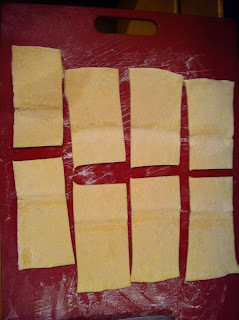 1. you didn't actually mention the egg wash int he recipe, can I assume you brush it on the puffed pastry before baking? 2. do you have a link to your egg recipe you made with the extra egg? That looks easy and yummy! !